14.04.2013 - Batam. Movie!!?? don't forget to buy caramel popcorns.! 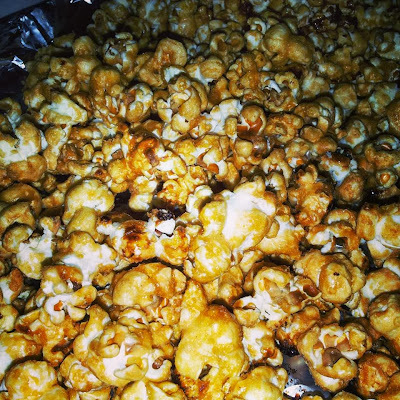 I love Popcorns, especially sweet caramel popcorns!! sweet and delicious! I can't remember when was my last caramel popcorn, i guess almost 4 to 5 years ago! not getting any chances to buy myself caramel popcorn or watch a movie either. Making caramel popcorns i can say is not that easy and not that hard too. Is up to you to judge. Anyway, i have fun making them. I ate only a few at least i have satisfied my crave! 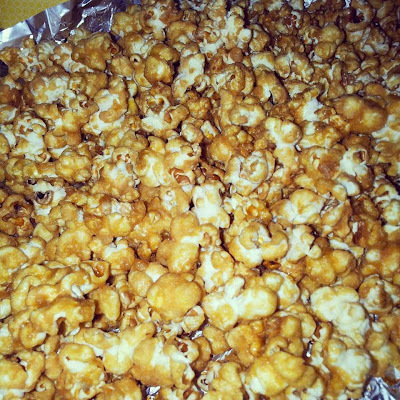 Im so happy now, knowing how to make my own caramel popcorn now!! :) Yeah!! * Used soup pot with lid. Put about 1/2 cup vegetable oil, about a second drop in 1 kernel to try if the oil is hot enough..
* When pot is hot, add in 1 cup of kernel and give it a shake to the pot to even it up and make sure do not over crowded the pot and cover with lid, let it pop. When it started to pop give it a quick shake and return to heat. So it will even up the popping process. When there is no pop sound means its done. *Pre-heat oven to 180c, Bake for 10mins more or less. *Keep checking your popcorn every few minutes. If the popcorn is golden brown with a crunchy dry coating, its done. *Be careful, popcorn can burn very quickly, Don't burn your popcorns!.